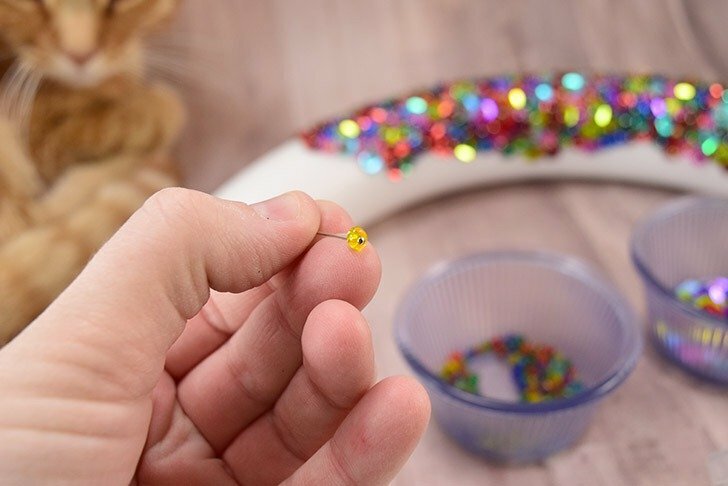 I remember when I was a kid my mom bringing out tons of little silver pins, colorful little beads, gorgeous and sparkly sequins and tons and tons of foam balls. You see I’ve always enjoyed making as has my mother and sister. Even when I was itty bitty I was a maker. Remembering these fun ornaments I decided that I wanted to make them again. 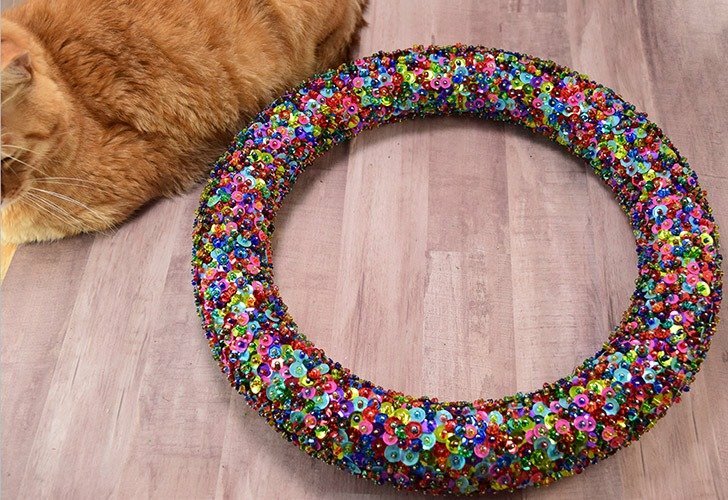 But when I happened to see a new foam wreath form hiding in my craft stash my plan changed just a little bit and I’m so pleased with the results. Now up front I want to let you know that this is a surprisingly time consuming project. I can’t sugarcoat it because if you want to get this done by Christmas you’re gonna have to hustle it. If you’re already swamped I would highly suggest pinning this puppy for next year! Oh, and though I don’t show it in steps I’m going to show you how to prevent this heartbreak. I’m not even sure how many hours I worked on this prior to this happening but I cried so hard that my little puppy Carly cuddled up on me. It didn’t help that I’ve been sick and therefore whiny and it didn’t help that I was exhausted and therefore even more whiny. But in the end I learned how to not have this happen to you so I suppose my craft fail was worth it. Sequins <— in bulk will save you money. 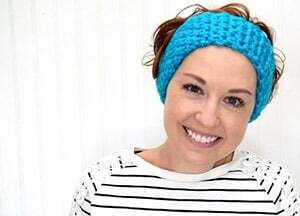 6/0 seed beads <— in bulk will save you money. 1″ metal sewing pins <— best deal I could find was when sewing notions are half off at Hobby Lobby. Let’s talk about that supply list for just a moment. 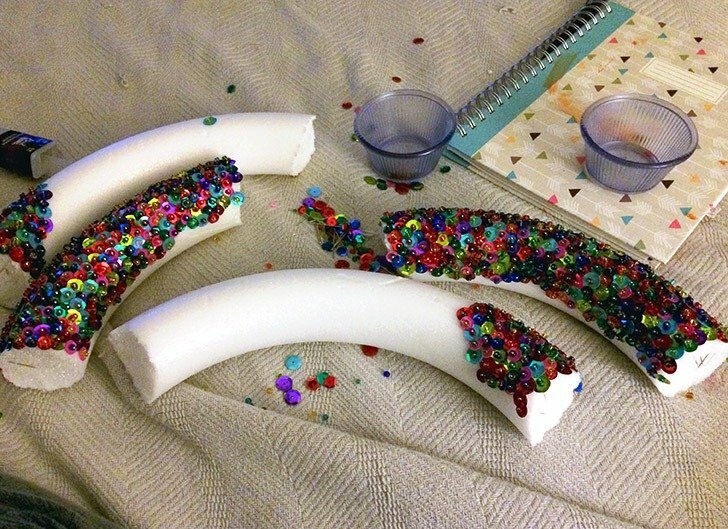 My first mistake was using a more brittle, white foam wreath. The first time that thing slid off of the bed and hit the rug over tile it cracked up like Humpty Dumpty. My second go I used a green foam wreath, which feels less brittle somehow and I purposely dropped this sucker from higher up and on straight tile and it did not break. Cue big sigh of relief. 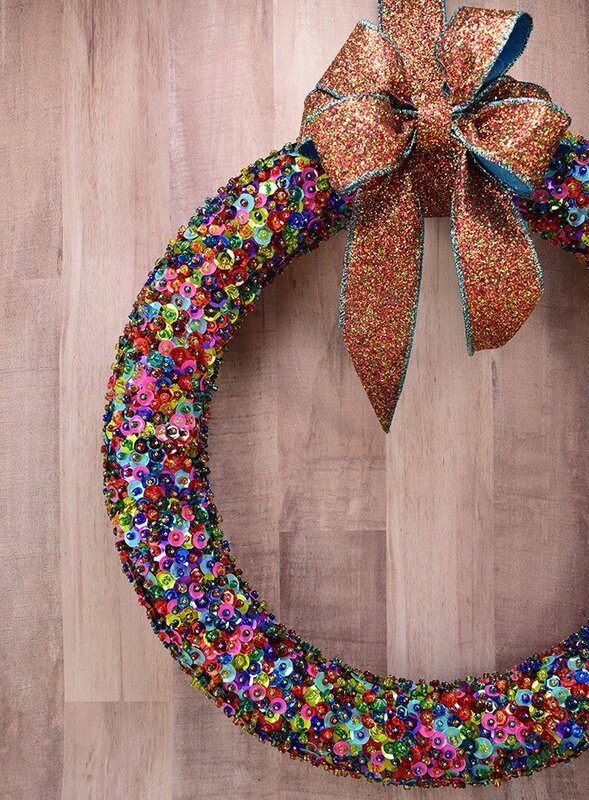 To make your wreath form as sturdy as possible grab the duct tape and go around the entire form at least 2 times. This way when it hits the ground if it does want to break the tape will keep it together. 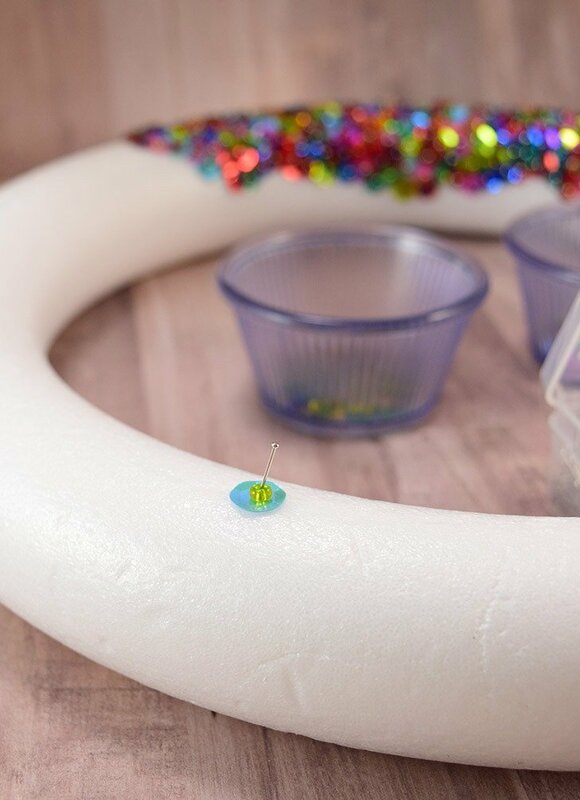 I doubt it will work with a whole bunch of accidents but if it happens to slip from your grasp once or twice this will help all of that time you’ve put into the wreath. Last but not least we need to talk about quantity. I literally purchased 1 package of pins and 1 package of beads and thought that would be close to finishing my wreath up. SO WRONG! In the end, for my 14″ form, I needed about 3,000 beads, pins and sequins so purchase accordingly. Whoo! I mean, you don’t want to be bawling and texting pictures like this asking your significant other to buy you a new wreath form on the way home from work now do you? :) Thank goodness for my Sweet Rob, man! The basic principles of making this are super simple. You can use pins with metal heads for a cheaper project or you can buy ones with a little orb on top that looks like a pearl or bead already but that probably won’t be as cost effective. 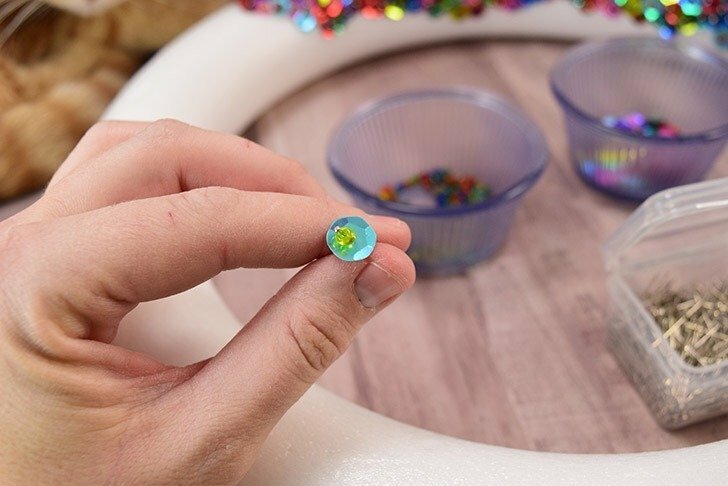 Run a bead onto your pin and give it a quick spin to make sure it stays securely on the pin. And push it through the duct tape and foam. Note, there is no duct tape, yet, as I broke my wreath shortly after I snapped my tutorial pics. I did find that the duct tape not only made my form more sturdy, it also helped to capture the pins with the adhesive making them more difficult to accidentally pull out of the catch a seam in your shirt or something. 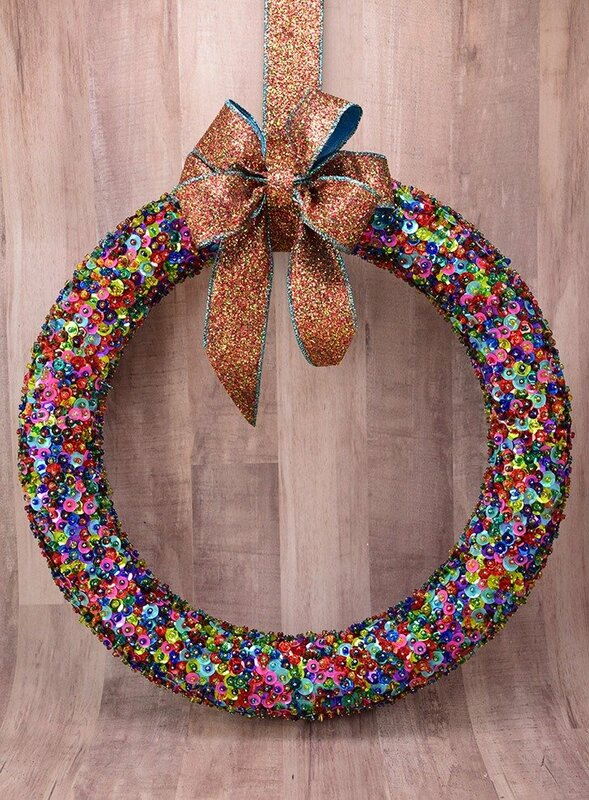 Go around and around until the entire wreath is covered. 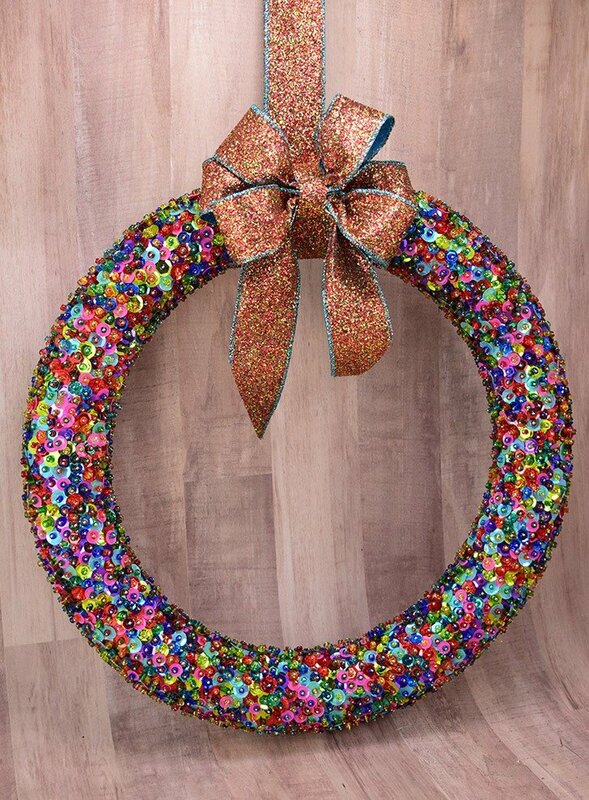 The beads and pins and all add quite a bit of heft to the wreath, so I’d advise also covering the backside in the same manner though it will most often not be seen. Otherwise you will have a front heavy wreath that doesn’t want to sit nice and pretty when hung. Yes, that’s about 3,000 things to poke into your form but I promise it’s worth it! To hang this guy grab some ribbon and cut it to twice the length you need it to be when the wreath is hung plus 2 inches. 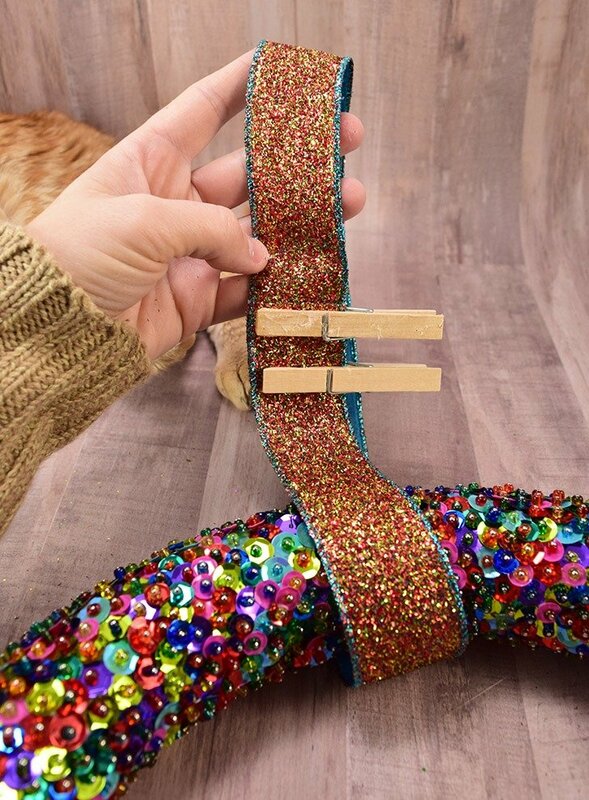 Double the ribbon over and apply hot glue to the top of that extra 2 inches and put the ribbon together to form a loop. Take care as hot glue can and will burn you (in fact I’d recommend low temp). Wooden clothespins will also help to hold the ribbon together with less risk of burning your fingers. Pull the loop taut around the wreath and glue it in place by securing the ribbon. The back of this join is a great place to put the hot glued seam of your loop to add even more strength to it. 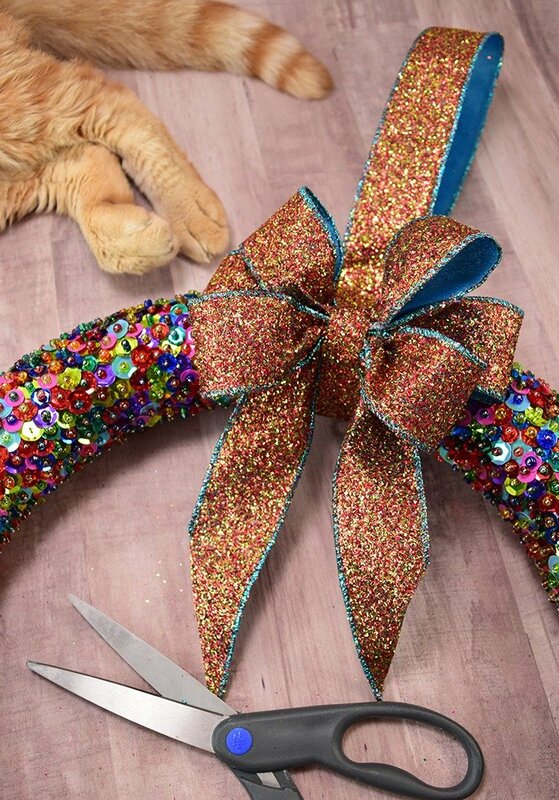 Attach a bow to the front of the loop where it rests on the wreath. Need help making the bow? I covered that in a tutorial yesterday. And that, my friends, is that! Though I made this for Christmas it can also work for the New Year and just about anytime, I suppose. In fact, I have a hunch that after the holidays this guy is going to get permanent residence in my craft room… BLING! 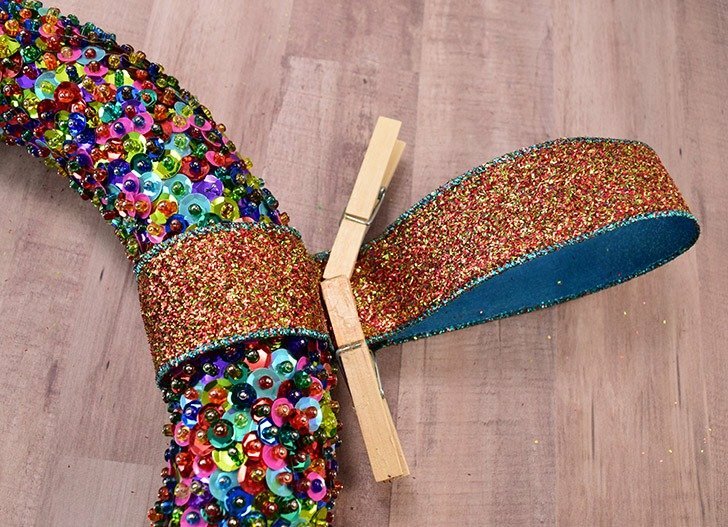 Now I do have a bit of regret… I really wish I would have used something a bit simpler for my bow and hanger but I love that crazy sparkly stuff and I simply couldn’t resist at the time. But in the end I’m still really happy with it and Rob said “that’s unique!” Not really but I’m glad he likes it :) And this time the friggin’ thing actually held together so I could finish it. Huzzah! I think it is absolutely adorable the way it is…GOOD JOB!